Hello friends, I am up a mother's day card. If you are my follower on Instagram, you might have seen the coloring progress of this yesterday. I just sat down to convert it to the card, quite happy how it came out. 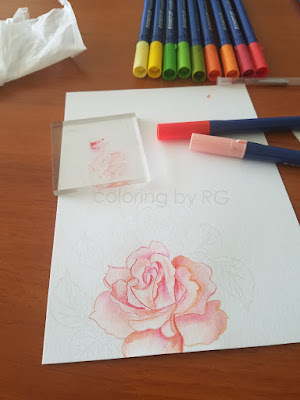 I did some stamping and masking using Versamark watermark ink, using the Uniko Pure florals Rose stamps. 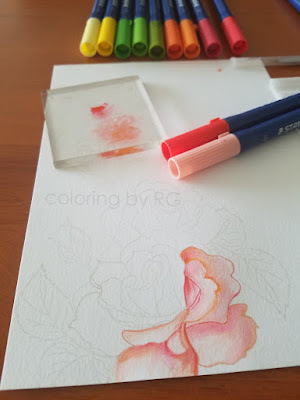 I used the Staedtler Marsgraphic brushes to watercolor the roses and leaves. Once the coloring was done, I added some splatter using ages Mahogany DI. I used a MFT Scalloped die cut panel and cut out the front, and addd back all the panels, but the scalloped one using the foam adhesive to pop the frame up for some interest, and I didn't stop there...I added some wink of stella to the frame. WOW, this is absolutely stunning!! Thank you for joining our challenge at Double D! WOW absolutely beautiful!!! 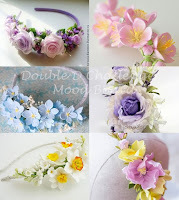 Thanks so much for joining in the fun at our Double D ‘May Flowers’ challenge! Good Luck and we hope you’ll come back often. Beautiful card. Thanks for sharing at Pause Dream Enjoy Challenges. Wow, Rahmat! It really looks amazing! 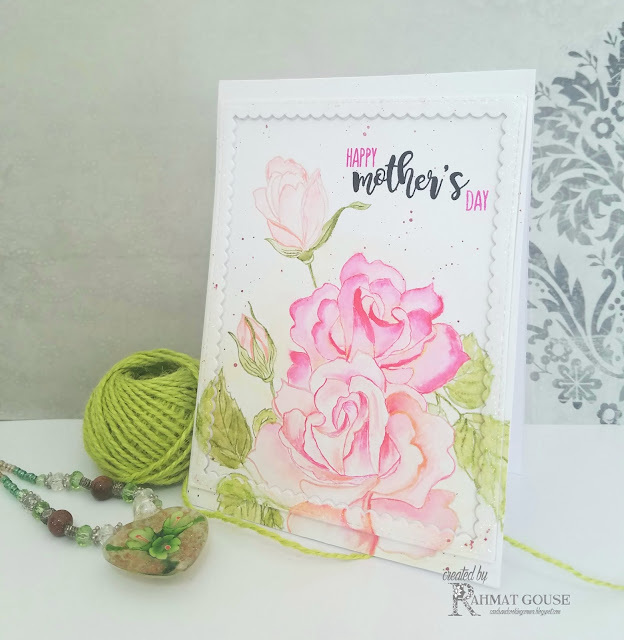 Beautiful colors, beautiful coloring and a gorgeous card! Swoon!! 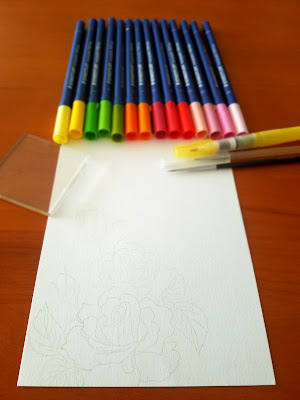 Beautiful...I must try that no line stamping and coloring...it's so striking. 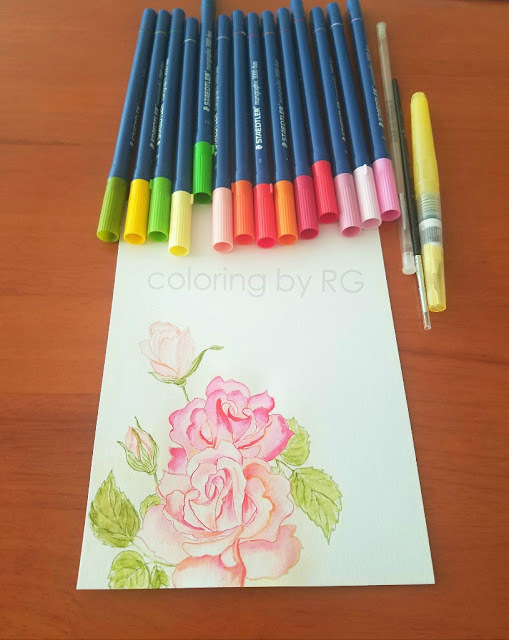 You blow me over with your colouring Di.. so inspiring to see you make these beauties. Gorgeous card! 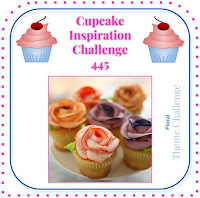 Thank you for joining us at Cupcake Inspirations, floral challenge. Sending love. 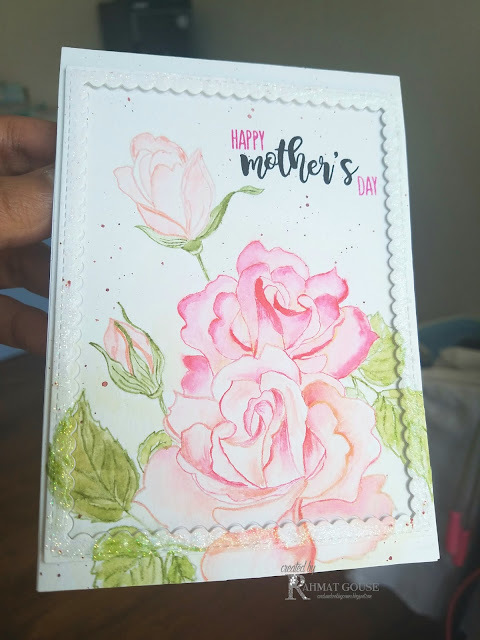 Beautiful stunning card. I love this card and images so much. Your are awesome at no line coloring. 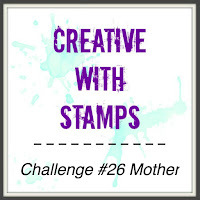 Thanks for sharing over at Creative with Stamps. Absolutely beautiful!! Thanks for joining us at CAS-ual Fridays. Beautiful card! I love your no line coloring!